When Indian journalist Sonia Faleiro first met Mumbai dance bar girl Leela she couldn’t have imagined that five years later their experiences would lead to the creation of a critically acclaimed account of the young dancer’s life on the wrong side of the tracks. 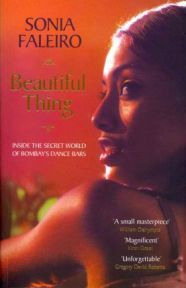 Curiousbookfans loved her book, Beautiful Thing – Inside the Secret World of Bombay’s Dance Bars and wanted to know more about Faleiro and her book. And if you’d like to know more too, we have three copies of Beautiful Thing to give away this month – check out the Forum for more details. CBF:It seems like the world in which you researched your book is very different from the world you grew up in. How did you make your first contact with Mumbai dance bar culture and gain the trust of people from such a very different world? Sonia Faleiro: If you’re a reporter in India reporting on marginalized communities for the English media it’s almost certain that your social and economic background, and therefore your life experiences, will be very different from those you write about. But that doesn’t mean that you can’t learn about the lives of others. You can, if you invest the time and have interest, sensitivity and compassion. I met Leela through a source in what I call the ‘bar and brothel business’. She was 19 at the time, and one of the smartest young women I’d met anywhere. I immediately knew I wanted to write about her and so I asked if I could follow her around. She initially thought I was kidding and shooed me away, but I was so persistent she eventually gave in and allowed me to hang around. Over time she came to trust in my project, and in me and introduced me to her family and closest friends. CBF: I was overwhelmed by some of the personal dangers you subjected yourself to in researching this book. What were the scariest things that happened to you and did you ever stop and ask yourself if you were taking too many risks? Sonia Faleiro:I take risks for my job if I have to. But I do exercise caution. I carry pepper spray, I try and make sure at least one person knows where I’m going, especially if I’m stepping out in the middle of the night, and I always listen to my instincts. It’s never pleasant being taken somewhere by someone you barely know to meet someone you don’t know at all. That happened a few times especially during the period when Leela went missing. CBF: I’m by nature a bit of an interfering do-gooder. Was it ever hard for you to be caught up in the need to remain objective and to not really be able to step in to try to change things for the better? Sonia Faleiro: Yes it was! As you can tell from the text, Leela was adamant about not accepting advice, let alone money, from me or anyone else. It was hard to see her repeat her mistakes with the same awful results. But she was an adult and made her own decisions. The best thing I could do for her was respect her choices. CBF: You use a lot of untranslated local language. Most of this is guessable in the context but was it a conscious decision to not translate and to avoid over-burdening the book with too many footnotes? Sonia Faleiro: It was a conscious decision not to translate. After appearance, it is language that most accurately tells of who we are and from where and what out experiences have most likely been. And the language of the dance bar isn’t pure Hindi, which is what most Indians speak. It’s a unique and very salty mix of Hindi and English and was even to me incomprehensible at the beginning. To remove Leela’s language from the story would have removed a very important part of who she was and how she came across. CBF: I read that Beautiful Thing took you 5 years to research and write. How did you support yourself during such a long gestation period and were you confident there would be a book at the end? Sonia Faleiro: I licked a lot of paint off the walls! Actually, I did what all writers do: Lived frugally and did some freelance writing. I knew I’d end up with a book, I just didn’t think it would be as soon as five years! CBF: The quotations on your cover include praise from some of the best-known Indian writers and writers about India – were you surprised to find such acclaim on your first book? Whose praise meant the most to you? 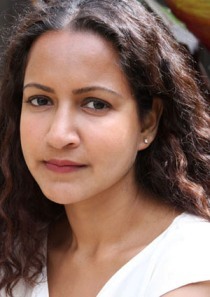 Sonia Faleiro: I’m so grateful to the writers for taking the time to read my manuscript. Writers have enough to do without being pestered for blurbs, and the fact that such well-known writers would give me their time is testament to their generous spirit. CBF: You write non-fiction that’s so exciting it reads like a novel – do you have any plans to write fiction in future? Sonia Faleiro: I’m afraid not. I’m committed to the experience and process of non-fiction. CBF: I’m hoping we don’t have to wait a long time for your next book. Do you have anything in the pipeline and when can we expect to see your next book? Sonia Faleiro: It’s so kind of you to say so, thank you. I’m trying to understand the experience of growing up poor in India, and I imagine the research is going to take a while. I’d like to say ‘soon’, but that’s probably not true! No Comments on "Q&A with Sonia Faleiro"